There is a moment in “James Rolf High School Twentieth Reunion” in which Lizzy Caplan’s performance reaches heights traditionally associated with prestige dramas or higher-brow sitcoms like [early seasons of] The Office. It’s an absolutely devastating dramatic moment, and both Caplan and her scene partner, Adam Scott, knock it out of the park. The scene is also a great example of how effective the Party Down writers could be with drama when they wanted to be. “James Rolf High School Twentieth Reunion” is an astonishingly good episode of T.V. It contains the aforementioned Henry/Casey scene, which is the best and most important scene relating to that particular relationship in the run of the show. This alone is enough to cement “James Rolf” as perhaps the best episode of Party Down besides the pilot. “James Rolf” is also a spectacular character study on Ron Donald, revealing some of his previously unknown “Party Down Team Leader” origin story. 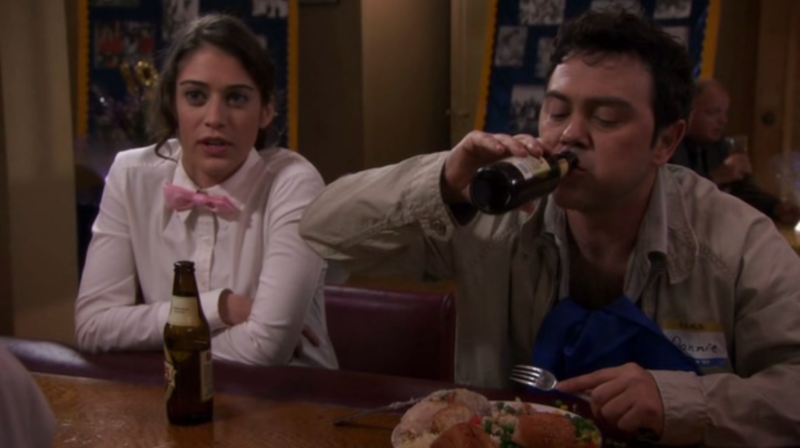 Additionally, the episode has two of Party Down’s best guest appearances in Molly Parker and Joe Lo Truglio. “James Rolf High School Twentieth Reunion” is centered on the titular high school reunion. What makes this episode’s catering event different from any other Party Down event, however, is that it is Ron’s high school reunion. Misguidedly, Ron thinks that catering his reunion and showing off his newfound status as “Team Leader” will impress all of his long-ago bullies and the girls that ignored him in high school. One of those girls who ignored him is Melinda Weintraub (Parker). Melinda was always an ambitious person, an achiever; who, during high school, wanted to be a Senator (comparatively, Ron’s life goal while in high school was to “catch more frogs than anybody else in the world”) – in fact, Melinda organized the reunion. She barely even remembers Ron Donald, while he perfectly recalls the back of her head from all those years of sitting behind her in science class. Ron clearly had a crush on her for years. Luckily for Ron, he manages to connect with Melinda once his staff’s respect for him has been demonstrated, exaggeratedly, in front of her (that fact that she gets progressively drunker as the party wears on is at least a factor in her acceptance of Ron as a viable option of a classmate to socialize with). Unluckily for Ron, their first one-on-one conversation is interrupted by the arrival of his high-school best friend, Donnie (Lo Truglio). Donnie is a loser. He lives with his parents, works at a retirement home where he “hardly has to do anything,” and is in general a pitiful piece of human trash. As soon as Donnie arrives at the party, he makes a beeline for his high school buddy, Ron, wanting to catch up with him. Ron, on the other hand, wants nothing to do with Donnie. He tries his darndest to avoid being associated with Donnie in fear of being categorized as a loser, as he was in high school, instead of the successful Team Leader that he is today. We get a real sense as to what Ron’s childhood was like – it’s just about as bleak as we could have expected. Melinda, who I haven’t really spoken enough about, has a full arc of her own in “James Rolf High School Twentieth Reunion.” It’s a surprisingly tragic story, on-par with Ron’s. Molly Parker, who was of course brilliant in Deadwood, is wonderful here in simultaneously subtle and extremely loud ways. She manages to create an entirely real, fully formed character immediately upon showing up onscreen. In another corner of the episode, Casey has just found out that Henry is planning on leaving L.A. and moving back home with his parents, having decidedly given up on an acting career. The way the Henry/Casey storyline plays out in this episode is remarkable. It allows Casey to show some of the vulnerability that she has kept buried inside over the course of the season. In a moment of particular, uncharacteristic openness, she asks Henry to stay – not because by moving home he’d end up like Donnie, but because she, Casey, can’t imagine having to go back to living without Henry in her life. “James Rolf High School Twentieth Reunion” is why I love Party Down. More accurately, episodes like “James Rolf High School Twentieth Reunion” are why I love Party Down, as “James Rolf” is certainly not the only one of its kind (just look at the pilot). I can say without exaggeration that “James Rolf High School Twentieth Reunion” is just about as good a sitcom episode as I’ve ever seen. It’s nearly perfect.